I have a client who requested I paint one of those weird Mediterranean style pieces from the 70’s to go in her nursery. I like painted nursery furniture better than stained wood furniture and this piece really needed painting. A coat of paint gave the dresser new life and it doesn’t look weird anymore. You can see from the paint color that the baby is a girl! Doesn’t that color just make you smile. Says “girl” for sure. The dresser came from the Nashville Flea Market. It wasn’t much to look at but I could see the potential. My first step in a project is to clean the furniture and the hardware. I removed all the drawers, vacuumed out the dust, and then cleaned the dresser with Simple Green. You can see in the upper left photo where the original finish is damaged. The top of the dresser is actually MDF. That stuff bubbles up like crazy when it gets wet. One way I take care of that is to sand the bubbled areas very carefully until they are flush with the rest of the area. Next I apply a light coat of primer over the area not getting it too saturated (wet). I let that dry then prime the whole piece. I use Glidden Gripper Primer tinted gray. It only takes one coat of primer. You can see how the primed dresser looks in the lover right hand photo. One tip I wanted to share is about “labeling drawers”. Do you see all those drawers? Nine, to be exact. They only fit really well into one hole….that’s my experience anyway. When I remove the drawers I use a permanent marker to label the back of the drawer as to where it goes in the dresser. Now the job of putting the drawers back in place will be easy. I used a toothbrush and plain soap and water to clean the hardware. It was pretty grimy. I don’t know why there is a color difference in the pieces….maybe from age. The handles on the Mediterranean style furniture are a little overpowering but when painted a light color they’re beautiful. 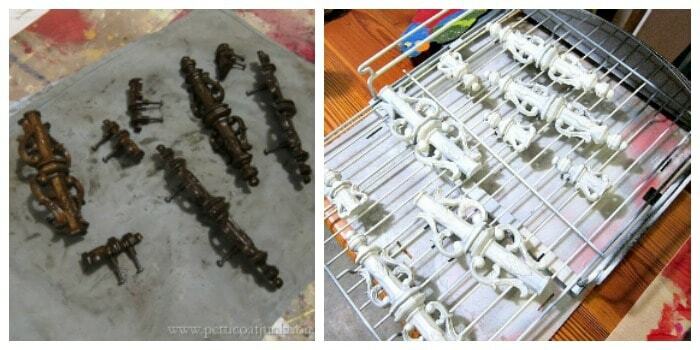 I used Rustoleum Heirloom White spray paint to give them a totally new look. The flower details and curlicues really stand out. Now for the dresser paint details. The client wanted a pinkish/coraly color. I selected a handful of paint chips in varying shades of pink/coral and she picked her favorite from those. 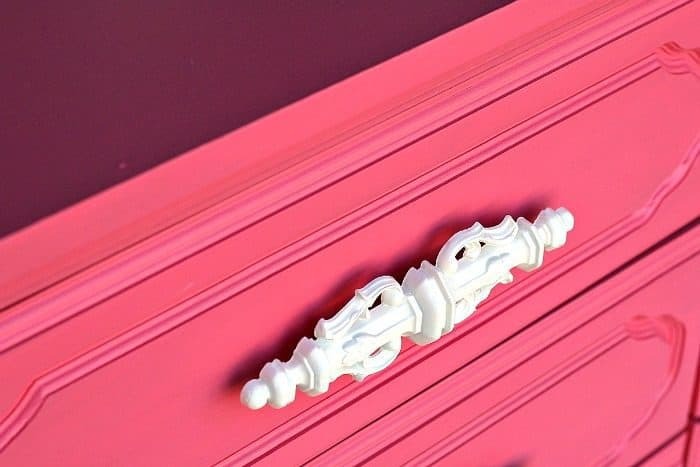 The color is Rose Heartstring ( a Glidden paint color), mixed in Behr Paint & Primer All-In-One. The color isn’t pink and it isn’t coral either…..it’s pink leaning towards coral! How’s that for a description? I brushed on two coats of paint and that was it. No distressing. 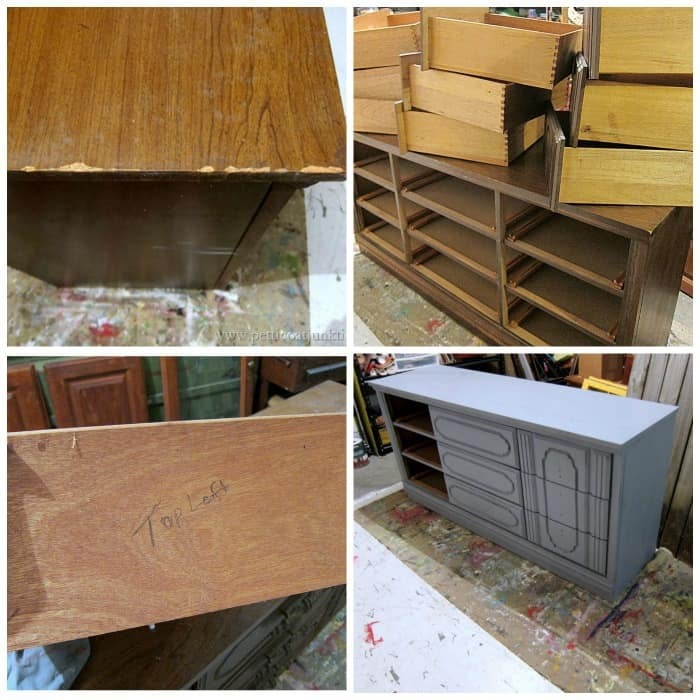 For one thing you can’t distress MDF furniture. No photos of me painting the dresser. You guys know how paint goes on so unless I’m trying to explain a specific technique you will not be seeing photos of me painting furniture. Maybe in a video where you can see the process as it’s happening. The white hardware really pops against the dresser color. I think the client picked the perfect color for the nursery. 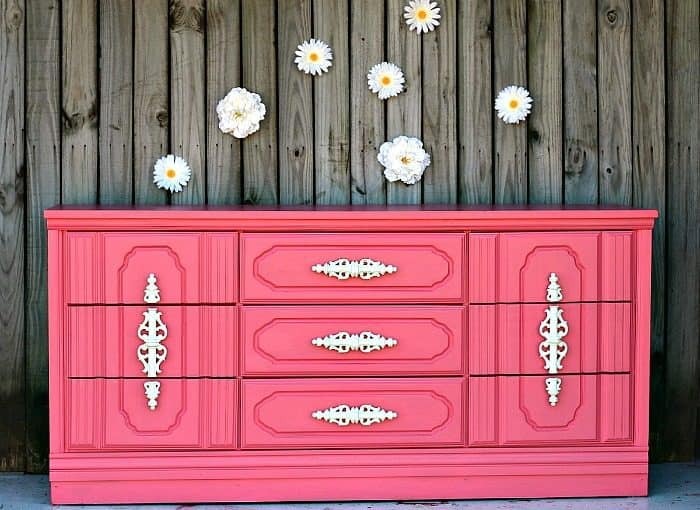 Painted furniture brightens and freshens any room and this dresser is going to look great in the nursery. We delivered the dresser to the client and she was happy with the newly painted nursery furniture. I always breathe a sigh of relief when a customer is happy. It’s more difficult painting a custom piece for a client than just painting a piece to sell in my booth. If you would like to change out hardware to update furniture watch my video below. The job is easy….. 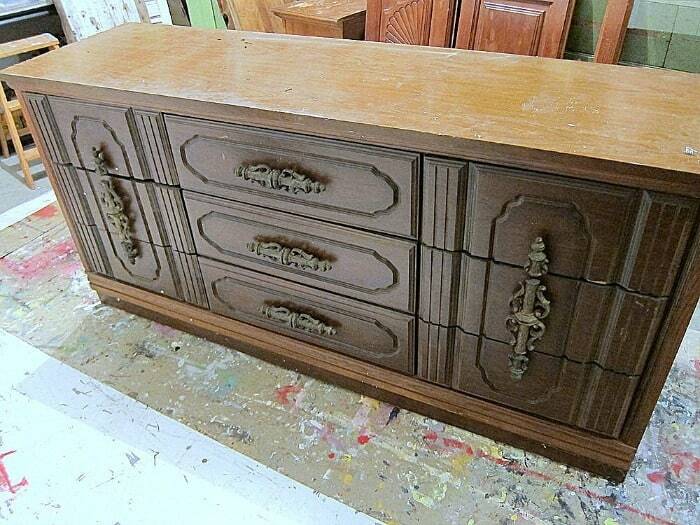 If you run across one of these outdated dressers think about how it could look painted, don’t just pass it by. 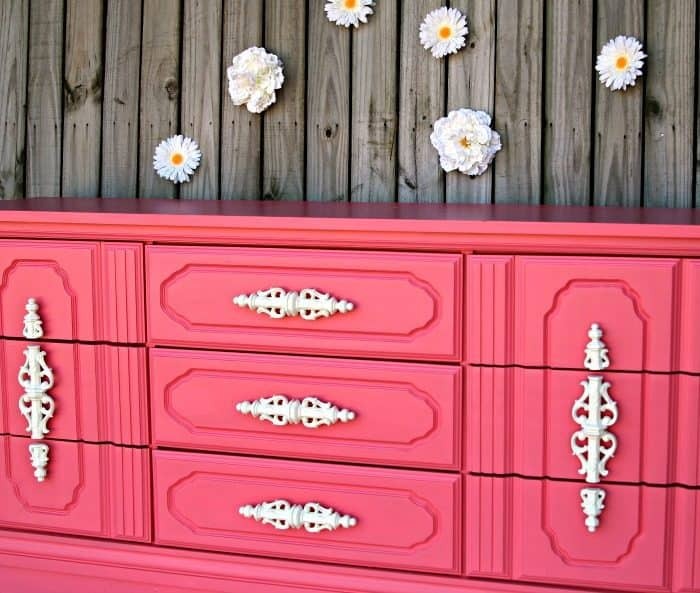 I have another funky outdated dresser and headboard I painted for a teen girl. The furniture was as weird as this piece. I painted the dresser a really bold color. You can see it here…..Frosted Pomegranate Bedroom Furniture For A Teen Girl. Showcasing favorite projects for new readers or for those of you who missed it the first go-round. This project first appeared on Petticoat Junktion in February 2015. Photos and details have been update. HI kathy, you did a great job on the dresser! I have a question. Any idea on the best way to paint a cheaper made bedroom suit with a faux marble laminate top on the dressers??? Stunning! What a gorgeous update on a 70s(?) model pc of furniture. I love it. The white on the pulls makes it pop even more. Keep up the great job you’re doing. I love your work and your spirit. such a show stopping transformation here. Hideous before, now – wow! – what a statement piece! Very bold, very beautiful and (I think the word is) sassy. I would think the client was delighted, I would be if it were mine. It looks very smooth did you add any Floetrol to the paint or primer? Do you ever put a clear coat on your pieces? I’ve never used Floetrol. I did put a General Finishes clear coat on the top of this piece. Sometimes I clear coat sometimes not! i am in LOVE LOVE LOVE with this piece! I can not get over how much i LOVE the handles. I must find me a piece with handles like this. Thanks for sharing. Such a perfect bright color! I can totally see this in my daughters room. Thanks for the inspiration! Pinned! Love the color and the daisies! This is unbelievable! Katy, you are amazing. Thanks for the awesome posts. When you have the primer tinted gray, what shade of gray do you prefer? I cannot tell if it is a light or medium gray. It’s kind of a light-medium gray! I know that really helps! I just tell the guys at Home Depot to tint it gray and they know what color…from experience I guess. That is going to make a beautiful statement in a girl’s nursery. Beautiful color – beautiful makeover Kathy! Stunning!!! I love this , great color. TFS. I love the color! 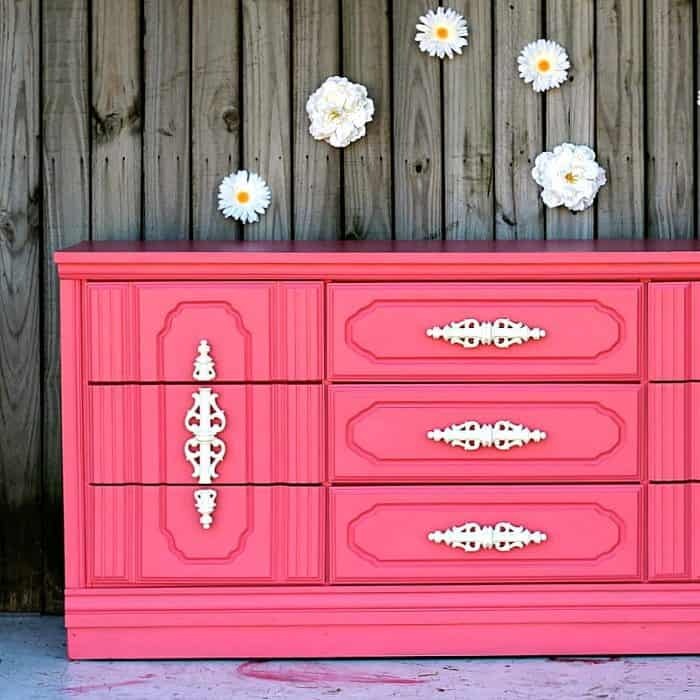 Perfect for a girl’s room! You did a great job on this piece. I love the color on the nursery furniture. Wow!!! This is beautiful. The color certainly transformed this. You did a wonderful job.